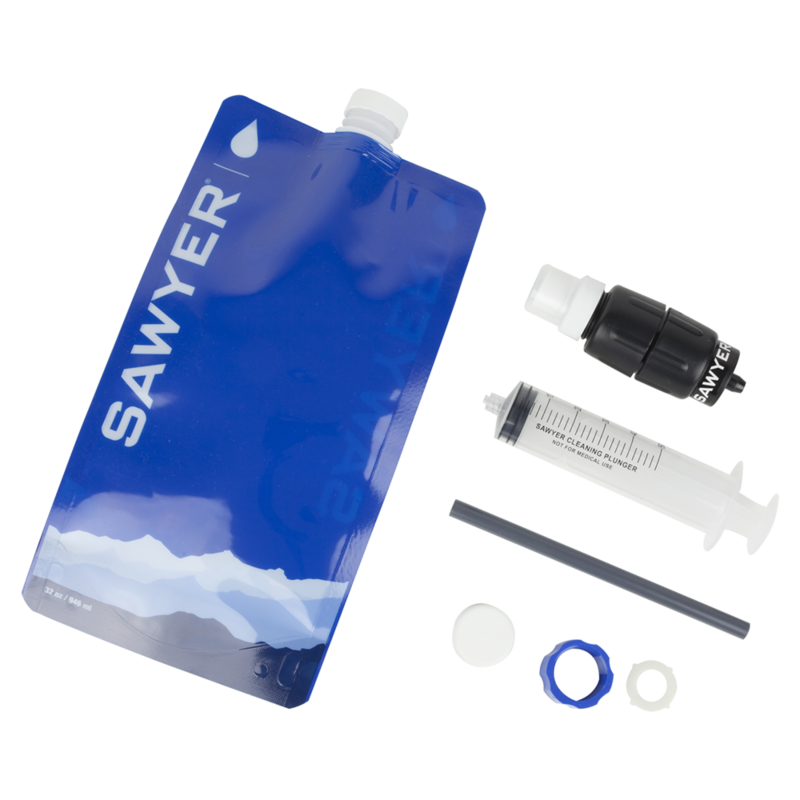 Sawyer recently released their new Micro Water Filter and we’re pretty excited about it. In a nutshell, the Micro is more compact, lighter, and more affordable than their very popular Squeeze filter. And unlike the Sawyer Mini - which weighs the same but has a slower flow rate - the Micro has roughly the same flow as the original Squeeze. After several months of field testing on the trail, the Micro is our new go-to Sawyer filter and we think it’s among the best backpacking water filters on the market, hands down. Incredibly lightweight and compact - The Micro weighs only 2 oz, which is excellent. It’s lighter and slightly more compact than the original Squeeze filter, while retaining the same functionality. Effective - The Sawyer Micro removes 99.99999% of all bacteria and protozoa, such as salmonella, cholera and E.coli, Giardia and Cryptosporidium. Easy to use - To start filtering, simply fill up the included pouch, screw on the filter, and either drink directly from the pouch or squeeze clean water into a bottle. Affordable - The Micro costs even less than the original Sawyer Squeeze, which was already among the most affordable water filters on the market. Easy to backwash - The Micro comes with a syringe for easy backwashing. Sawyer claims will restore 98.5% of the filter’s flow rate each time you clean it. We recommend backwashing your filter fairly often to keep up it’s flow rate. Good flow rate - The flow rate of the Micro is better than the Mini and about the same as the original Squeeze filter. It’s fast and effective. Versatile - You can use the Micro filter with squeeze pouches, a water bottle, or the included straw to drink straight from the source. Also, the Micro can attach in-line to a hydration bladder so you can filter while you drink, or set up a gravity filter system. Like all filters, the Micro requires backwashing - The more you use any filter, the slower it’s flow rate will get, and at some point you’ll need to replace it. Sawyer guarantees the Micro up to 100,000 gallons, but that depends on how dirty the water you’re filtering is. Frequent backwashing will help keep the Micro’s flow rate strong. We’ve been using ours for a long time now and it’s still going strong. Not good for winter trips - Like all hollow fiber filters, the Micro can’t withstand freezing temperatures - it’s interior fibers will break. If you do take the Micro on a chilly trip, try to keep it from freezing by putting it in a ziplock bag at the bottom of your sleeping bag at night. Not ideal for large groups - Like most filtration methods, squeezing can become tedious over time, especially if you’re filtering a lot of water for a large group. When traveling in groups, bring a few Micros (1 for every 2-3 people) to share the workload, or you may consider bringing a gravity filter. Squeeze pouches tend to wear out over time - Sawyer recently updated their pouches to make them more durable, which was an excellent update. That said, we almost always bring a backup pouch as they can break with a lot of use. Can be difficult to fill pouches in puddles, seeps, or lakes - We almost always make due, so this isn’t a huge deal, but it’s sometimes hard to fill sawyer pouches from shallow water sources, like puddles, seeps, and lakes. Pump filters tend to function the best in these conditions, but they tend to be bulky, heavy, and expensive. Doesn’t filter viruses - If you’re traveling in North America, this isn’t a concern. But for international travel, you’ll want to check the location to see if viruses are something you need to protect against. If so, filter first with the Micro, then throw in a Chlorine Dioxide pill for 100% protection. Weight, size, functionality, and affordability make the Sawyer Micro one of the best and most foolproof water filtration systems on the market. Also, it’s worth noting that Sawyer filters tend to be very popular among thru-hikers who are notoriously tough on gear over thousands of trail miles. Like all water filters, there are some downsides with the Micro, but we believe its pros heavily outweighs its cons. The Micro is our new favorite filter in Sawyer’s line-up and we highly recommend giving it a try.